Liz has left no stone unturned in her masterful preparations for Sunday’s first leg of the league. Here are your start times, a map, your volunteer information, and lots more. Looking forward to a great day! Our inter-club summer league promises to add a whole new dimension to riding club life over the next few months and the first leg is only just around the corner on Sunday 5 July. The event is pre-entry only and you must enter for the first leg by Monday 29 June. 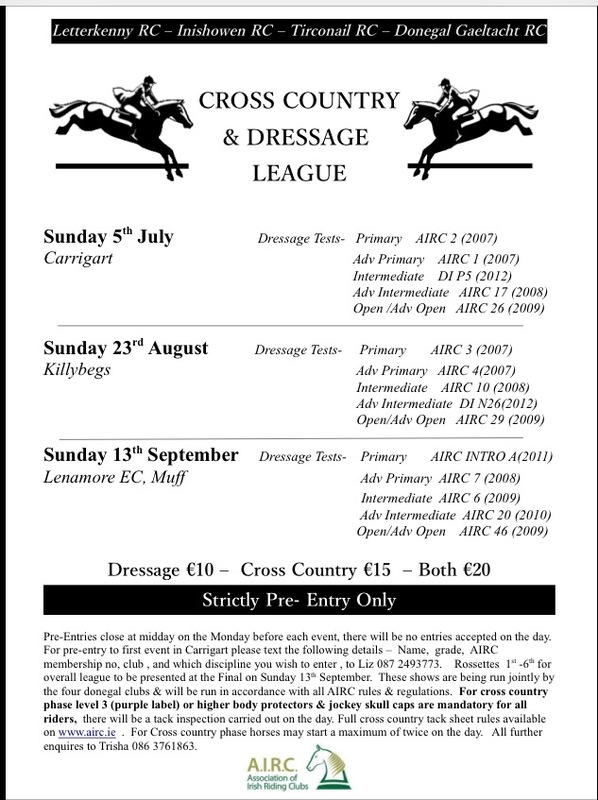 It’s not mandatory to do both disciplines – can do either or both and H/C entries are also accepted if you wish to ride below your grade. 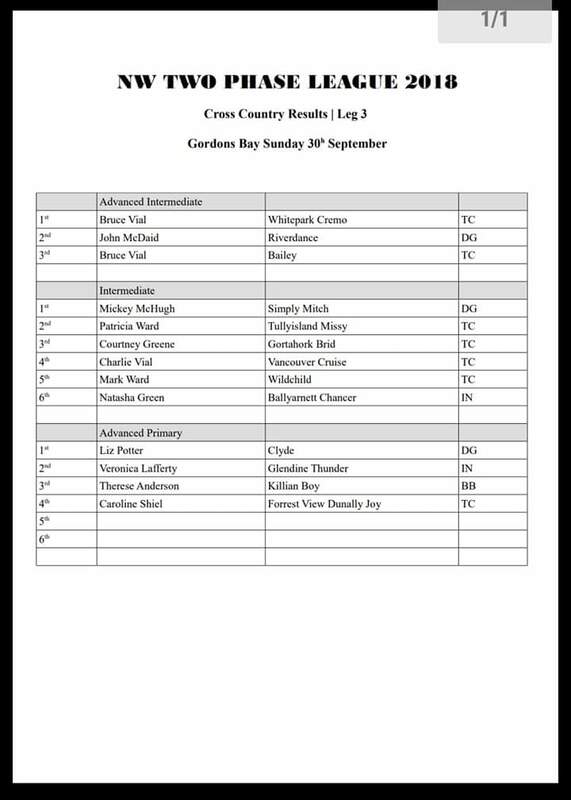 Dressage will start at 11am with XC following at 12 noon, starting with the highest grade in XC and working downwards to lower grades. Congratulations to our heroines – Nadine, Tanya, Vera and Louise – who have qualified for the Team Championship at the AIRC National Dressage Championships in August for the second year on the trot (your choice of collected, working or extended). 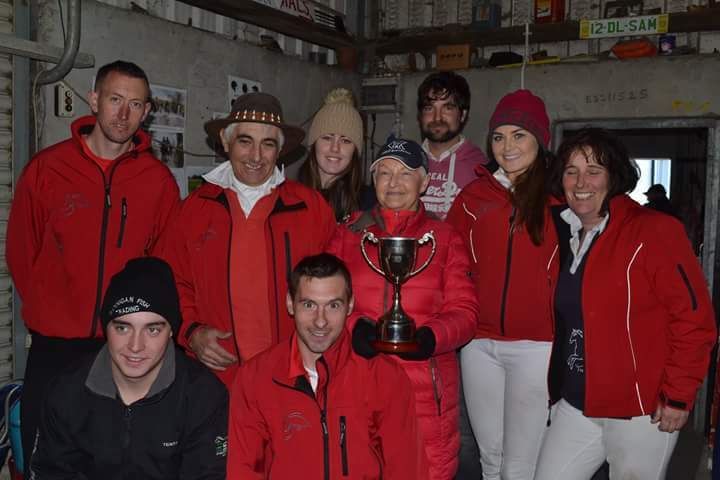 At a chilly Inishowen show at Lenamore on Sunday they once again showed that we are more than capable of holding our own in the dressage arena. 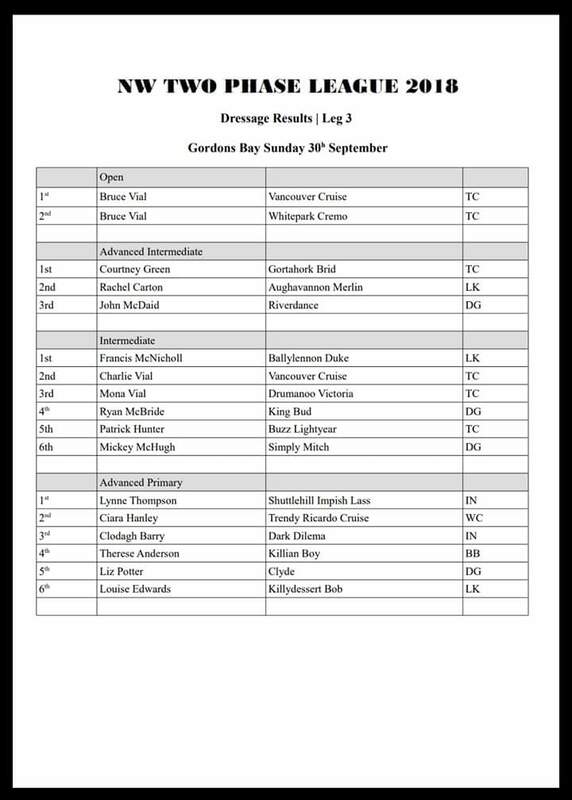 Well done to everybody else who competed on the day and won or placed in their classes. All photos greatly appreciated. 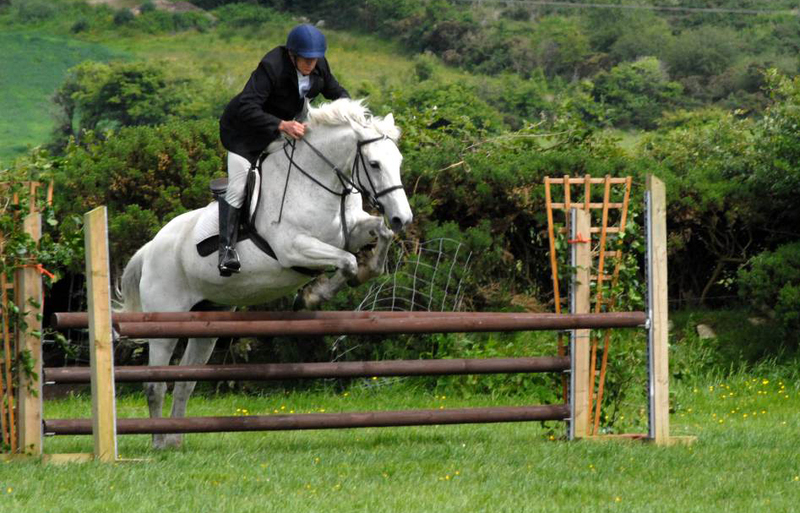 It’s nearly time for our annual big day out at Hillsborough Farm, competing on grass as the summer gets into full swing. Our show follows the same format as in previous years. We have a new dressage judge, just to keep everybody on their toes, with Jackie replacing Petra in the hot seat. We’ll be building the course on Friday 12 June and everybody is asked to come out and lend a hand. Many hands really do make light work. Please also make sure that you contribute as much to the jumps collection as possible, and particularly to the dressing department. It’s quite amazing how plants, brush and some well chosen props can transform the course into something we can really be proud of. Pictured below: Tanya, Nadine and Paddy competing at last year’s renewal. 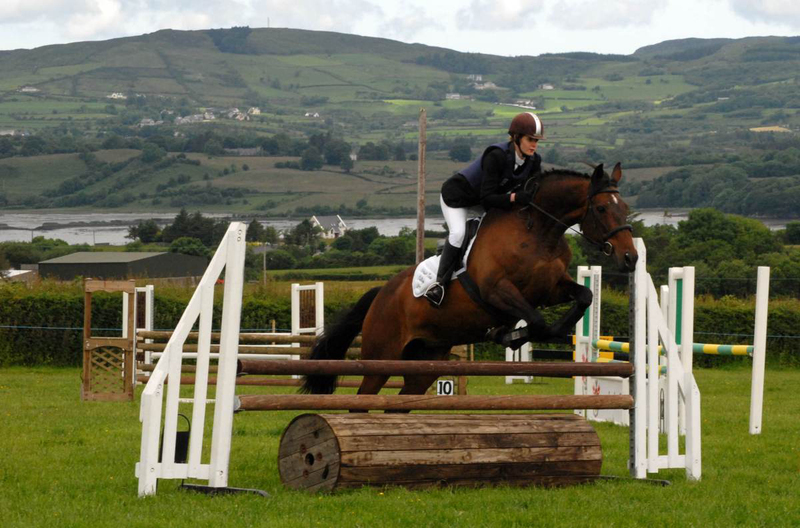 Lenamore is the venue for Inishowen’s annual spring show next Sunday, 24 May. 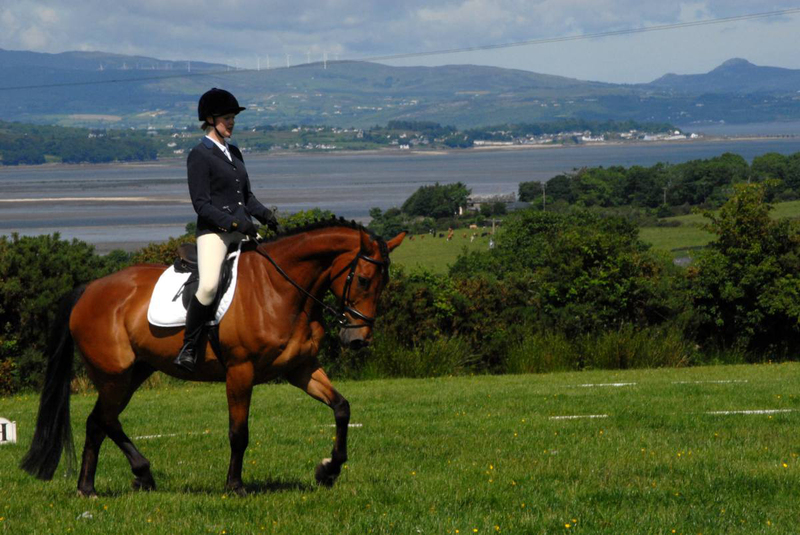 This year the show hosts the regional dressage qualifier and you should contact Tanya on 086 100 2972, if you’re interested in riding on a team.